The West Michigan American Foundry Society (AFS) Chapter provides technical, educational, social and networking opportunities for the local foundry community. Our membership includes metal casters, metal suppliers, foundry material suppliers, industry consultants and vendors. The theme of our March meeting is education. Prior to the meeting we will have tours of local manufacutring facilities, and a tour of the brand new Muskegon Community College Sturrus Technology Center. The meeting will include a presentation of opportunities in the metal casting industry as well as available scholarships and stipends.Most of the attendees will be students from local high schools. Each $20 donation will sponsor a student’s dinner. Whether or not you are able to attend, please help introduce the next generation to our industry. Learn more about the history of East Jordan Iron Works. 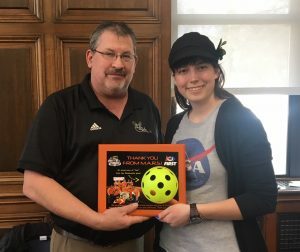 Anna Basaj (right) presents Chapter president Rich Chase with an appreciation award from the MARS Rovers robotics team. Want to be part of West Michigan's AFS? Join Now! Check out Foundry In a Box Look Now!